This PlayStation 4 Slim is more than a gaming console. With access to social media, streaming through Wi-Fi, and of course, gaming, this console is the ultimate entertainment system. Connect with your friends to broadcast and celebrate your epic moments at the press of the Share button to Twitch, YouTube, Facebook, and Twitter. 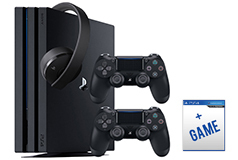 Includes a new slim 1TB PlayStation®4 system, 2 Controllers, Charging Block, and Two Games. Play online with your friends, get free games, save games online and more with PlayStation Plus membership (sold separately).